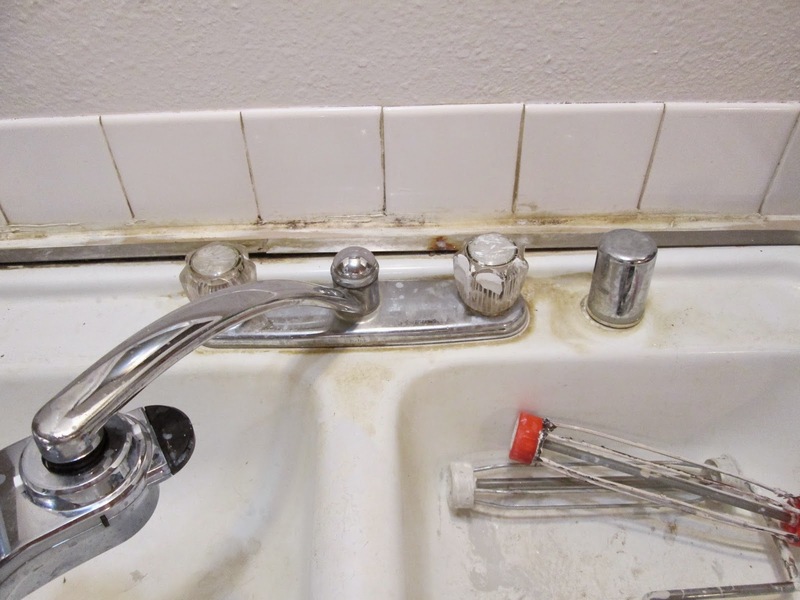 The sink - no caulking! In August, my son and his wife purchased a fixer-upper. If you're like me, you watch these DIY shows and think, "That place isn't so bad. I could do that." My son purchased a place where I thought, "This place is bad!" And I don't mean bad in a good way. I mean as in "You bought this place!" I walked in their new home determined to pitch in and help. It wasn't encouraging. Cleanliness seemed to be a challenge for the previous owners, so I spent a lot of time cleaning rather than doing any significant DIY work. The photos below show how a lot of elbow grease, Comet, and a stiff brush can make a dent in shower grime. Eventually, I discovered the usefulness of Mr. Curtis' 1" putty/drywall knife (hint: wet the tub/shower down really well and gently run the flat edge of the knife over the grime. It takes up layers). I did get it to look great eventually (4+ hours later). Considering the tub is really wide and in good shape otherwise, it was worth it. Someday we'll take out the surround and tile. I did get the kitchen cabinets painted and the doors hung during my visit, although my daughter-in-law hasn't yet decided on knobs/handles and a drawer needs new guides put on. We took the kitchen from old country look to a more modern gray. They're hoping to change out the counter-top, get a new sink, and install a back-splash sometime in a future. We painted the entire house - floor to ceiling. As you can see below, the previous residents loved color (although we couldn't figure out why they put paneling over the baby's walls instead of painting or why they sponge painted the ceiling - we'd never seen that before). Have you ever moved into a place that was really dirty or needed a lot of paint and polish to make it livable? I'd love to hear about it. When she's not doing DIY projects, Melinda Curtis writes the Harmony Valley series of sweet romances for the Harlequin Heartwarming line. Brenda Novak says: “Season of Change has found a place on my keeper shelf”. 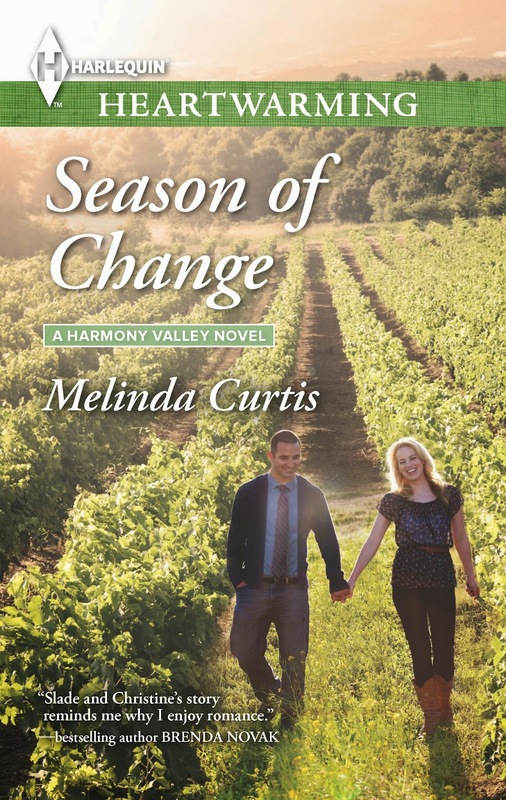 Melinda follows the NFL because one young quarterback is from her hometown, and follows Duke basketball because Mr. Curtis has a man crush on Coach K. Her latest sweet release is Season of Change, book 3 in the Harmony Valley series. I've done this sooooo many times! You have to wonder about people who would spend time sponge painting a ceiling or painting over paneling, but can't seem to scrub a tub. Different priorities, I guess. You're a good mom to help them out! Mr. Curtis thinks there's something wrong with me - I find it relaxing to paint. I love the before and after pictures. You worked wonders there, Melinda! Can I say the thought of cleaning that tub makes be squeamish? Eww! But I love the progress you are making! It looks so different and yet there's still much to do! Good grief - you're amazing!!!! Melinda, I admire your fortitude in cleaning that tub. Fortunately, I've mostly moved into new homes. We've had two resales and both were in good condition when we moved in. The decor was not to my liking but a little remodeling took care of that. However, we did own some apartments, and I couldn't believe the way some people liked to live. It is not fun to remove someone else's grim. I can't seem to spend the premium to buy houses in immaculate condition, so I keep redoing them before I move in!